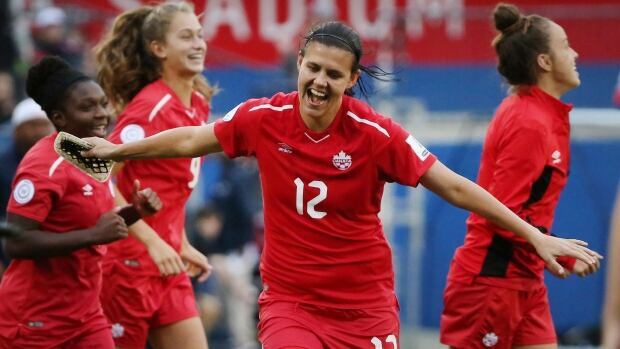 Christine Sinclair scored twice and Canada went on to secure a spot in next year's World Cup in France with a 7-0 victory over Panama on Sunday in the semifinals of the CONCACAF qualifying tournament in Frisco, Texas. Sinclair now has 177 international goals. She ranks second on the career list — among both men and women — behind former U.S. forward Abby Wambach's record of 184 goals. After her header in the 44th minute gave Canada its opening goal, Sinclair pumped her fist in celebration. She added another header in the 49th minute. Adriana Leon, who came in as a sub for Sinclair in the 68th minute, also scored a pair of goals. The United States plays Jamaica on Sunday night in the other semifinal match at Toyota Stadium. The U.S. team, ranked No. 1 in the world, is the defending champion of the sport's premier event, having won the final in 2015 against Japan in Canada. The final and third-place match are set for Wednesday night. The top three finishers in the CONCACAF Women's Championship will represent the region in France, so the winners of both semifinals earn a berth. The fourth-place finisher will face Argentina in a playoff for a spot. Canada, ranked No. 5 in the world, will make its seventh World Cup appearance. The only time Canada has missed out on the game's premier tournament was in 1991, the event's first year. Canada had the best chances in the first half, including Allysha Chapman's shot in the 12th minute that was just off target and hit the side of the net, before Sinclair broke through. Jesse Fleming added another goal for Canada in the 48th minute, a short time before Sinclair's second. Janine Beckie and Rebecca Quinn also scored before Leon's brace. Leon has six goals in the tournament. Diana Matheson made her 200th appearance for Canada. The midfielder has played for the national team since 2003.